Connor: I'm so proud of this kid. 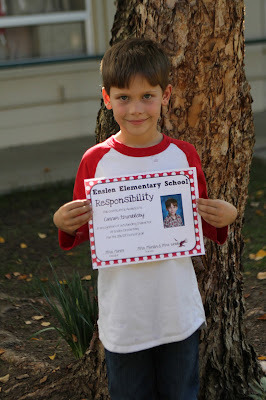 He was awarded with the character trait of responsibility at school. Sure, he refused to look at me or even talk to me after the assembly. But I was glad to be there and happy to hear his teachers find him responsible. Isla: There almost always is a stuffed animal on our journeys with us...or some other trinket. I love watching her imagination at work. Callum: Oh hey, Callum's first fall. Glad you are finally joining us. Callum really likes crumbling up the crunchy leaves in his hands...then tries stuffing them in his mouth!